Now here’s an idea for regional dailies chasing branding solutions and meaningful readership per copy figures. Why not post each day’s edition up on noticeboards in the main local parks? 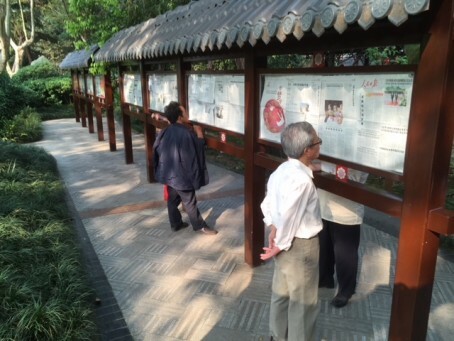 That’s what at least one of the major regional dailies in China is doing, as seen here in pictures I took in the People’s Park in Chengdu, capital of the Sichuan province, earlier this month. 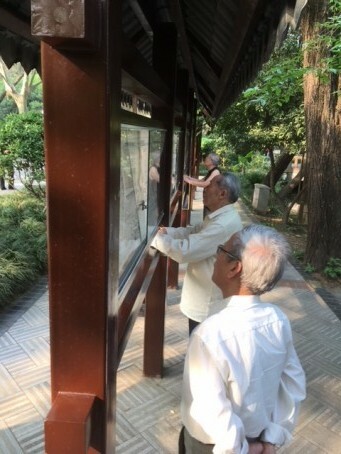 I stood and watched as lines of people – mainly men, and largely aged 50-plus – spent time reading through every page of their local paper, the Chengdu Daily. It was a sunny day, but note that the smart lines of noticeboards have handy covers to protect their readers should it start raining, with the pages themselves nicely waterproofed behind glass or perspex. I realise that the existence of such walls in China could well be the result of the government’s official and selective sanctioning of media it’s happy for the public to read. But that shouldn’t deter UK publishers from considering an option that could help the physical marketing of their independent content. One hurdle might be that public parks are not treated as respectfully in UK cities, whereas in China they’re very clean and tidy, with behaviour strictly controlled by huge notices telling you what you can’t do, and vigilant police strolling around most corners. But I can imagine erecting similar noticeboards in prominent UK city centre areas of high footfall where they might quickly get accepted as part of the furniture. Place them outside railway stations, for instance, or on the street in busy shopping centres or business districts, or on university campuses in sight of reception areas, or outside the main newspaper office. They would give big city titles a new presence that they have lost since ditching the majority of newspaper sales kiosks. The branding would not only promote the newspaper but could count as additional exposure for advertisers. Readers themselves could save their bus fares and avoid inky fingers – but still pop into a nearby newsagents for their own copy if they liked what they saw. For big breaking stories, newspapers could picture and film the interest of passers by in their pages. Planned carefully, a publisher could record average views per day – in figures and by videos – creating a new data set for ABC confirmation. The displays could become a talking point for locals – from politicians to shoppers, and from business chiefs to workers. Who knows – with the UK government seemingly so keen to help sustain regional newspapers, it might even consider funding the costs of such walls for every daily newspaper. 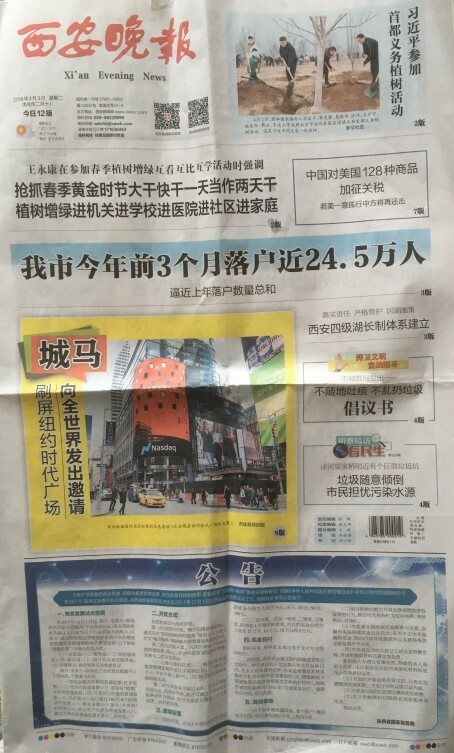 Also impressive was the cover price of Chinese local papers. 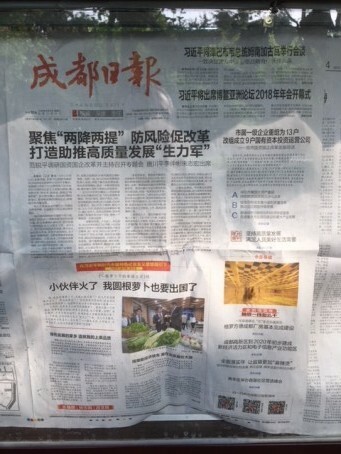 Over in Xi’an, my copy of the Evening News cost just 1RMB (about 11p), and look at the eight stories they managed to cram on page one of the 12-page, Berliner-sized main edition. Yes, there’s an element of sycophancy in the reports – according to the quick translations made for me – but this is said to be slowly changing as readers increasingly demand more transparent coverage of local affairs. Splash: Nearly 245,000 officially relocated to our city in the first three months of 2018 – nearly equal to the whole of 2017. Top right corner piece: President Xi Jinping volunteers to plant trees. Left-hand kicker above the splash: Local politician talking about working hard to improve society. Right-hand kicker: The latest in the Trump-China trade war (mainly warning the USA that China will kick back). Main picture: How information about the Xi’an marathon ended up being displayed in New York’s Time Square. Right column, top: A story about a local lake’s management. Right column, centre: A local leader’s warning against spitting and littering. Right column, bottom: Local water pollution worries. Slanted reporting issues to one side, I didn’t think this was a bad mix of story subjects – although I did note a lack of focus on named, pictured real people. Meanwhile, although official performance details of Chinese papers are not easily available, the city centre location and polished state of the Xi’an Evening News’ offices seemed to indicate they were as in as good a state as any other high street business. My lasting impression, however, were those great newspaper walls of China in Chengdu … and I look forward to HoldtheFrontPage readers’ views on whether anything similar could work here in the UK. You know what, I absolutely love this. I think it would be a tremendous idea. Obviously, someone will point out that people can stare at their local paper’s website on a laptop, but this is tactile – a real newspaper creating a splendid little community social space. Plus you can leisurely browse without being click-baited into some bizarre nonsense about “you’ll never guess what he did next with this McDonald’s Happy Meal” or have to wade through a survey about your washing powder preferences before reading further. I think something like this would give newspapers back their place in the community. A brilliant idea! They did this when I was in Moldova in the mid 90s, also outside a park in the centre of Chisinau. Always busy. The old Soviet Union displayed copies of Pravda the same way for decades. I agree that this is a great idea for daily and also local papers. It’s all about getting eyeballs on the paper, however that is done. …Furthermore (and at the risk of sounding a little obsessed with this idea), this would be an attractive proposition to print advertisers. After all, advertisers are deserting newspapers because there are simply not enough eyes on pages to make it an effective means of displaying wares and services. This kind of gives that a sudden lift. I’ll walk away from this subject now before I’m tempted to get back into newspaper management.